Today, we are having a half-day tour of The Mossy Forest of Gunung Brinchang with Eco Cameron Travel Agency. It is highly recommended tour base on tripadvisor reviewers. Bala (the guide) was very punctual with pick up time at our hotel. Hop into his Land Rover cruising along the picturesque rolling tea garden toward 6,666 feet above sea level, The Gunung Brinchang. Halfway stop to learn about how tea is grown and processed into different varieties. The tour continues with going to the highest viewpoint of Gunung Brinchang and another impressive view from top of the mountain. We went up to the top of the tallest mountain in Cameron highlands. 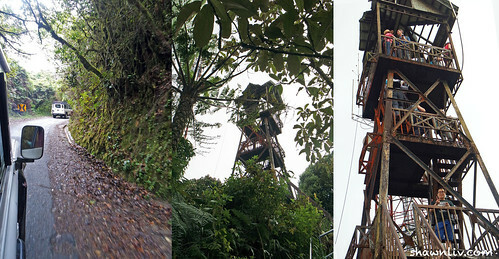 Mount Brinchang Lookout Tower is located the end of the same road from Mossy Forest. Next, an interpretive walk with Bala into the Mossy Forest and reveal some of the exotic floras on earth, like the Pitcher plant, Orchids, Primitive Ferns, Spices and Medicinal Plants. Bala was funny, very chill and answered any questions we had. After all, walk in clouds at Mossy Forest is the great experience. Mossy Forest offers exhilarating views and is the best place to visit. It is a chance to see a really unique and fragile ecosystem and bouncing on the trampoline-like peat soil provided endless fun. We are at Gunung Brinchang (6666 ft / 2032 Meters above sea level), one of the highest mountain points accessible by road in Peninsular Malaysia. The series of wooden platforms winds for about 150m through the mossy forest, but is slippery when wet, though there are rope railings for a light measure of safety. Next, a short drive down from the mountain will bring us to the Sungei Palas ‘Boh’ Tea Factory. Boh plantation located slightly north to Brinchang is supposed to be the largest tea plantation and the most famous one in Malaysia. Facts: The total land area is 1200 hectares and the company produces 4 million kg of tea annually which translates to about 5.5 million cups per day. This represents about 70% of all tea produced in Malaysia. Last, enjoy some pies here. Last but not least, quickly stop at the Raju’s Strawberry farms. Bala said we must try their fresh strawberry juice or milkshake. Yes, the strawberry milkshake is so good. Strawberry Milkshake is a must try. 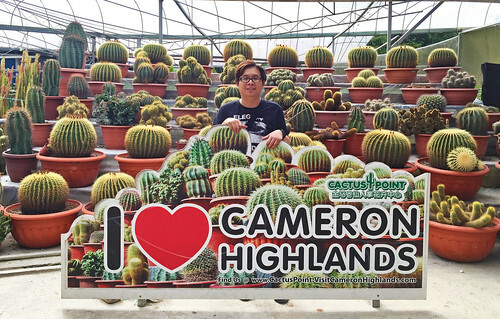 All in all, Eco Cameron Tours was worthwhile, RM53 per pax. Personally, I don’t recommend driving your own car to the mountain. The road is dangerous and in bad condition. The narrow road could only fit one car comfortably. Besides, prepared a good walking shoes on this trip, as it is muddy and slippery. After a short break, we are going to our next attraction, Rose Valley. Rose Valley located in the Tringkap Cameron Highlands. The valley house consists a wide range of rose species in all shapes and sizes ranging from the “Black” rose, “hornless” rose plant with 20 fragrant varieties and the colorful “miniature” roses. Other than that, there are carnation, hibiscus, orchids, transvaal daisy, dandelion and etc. Besides, there are peacocks and loads of koi in the garden. A plethora of lovely things can be found here. 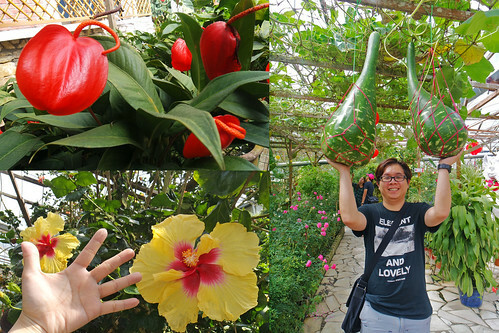 Next attraction is Ee Feng Gu Honey Bee Farm. Ee Feng Gu is open daily from 8 am to 7 pm. The visit to the bee farm is free of charge. Ee Feng Gu has already went through 3 generation and manufactured many products range from pure honey, royal jelly and pollen. All in all, there’s nothing special here. After all, we managed to buy some honey products and tried their honey drink. While on our way to the time tunnels, we decided to pay a visit to Cactus Point. It is located further up the Cameron Highlands plateau by the main road. Free entry! There are various cactus plants are placed prominently. Besides, they also have a popular flowers section and a small section of strawberry. All sorts of cactus can be found here, tall, short, fleshy and thin. Our last stop today was Time Tunnel Museum, Cameron Highlands. Time Tunnel is a local museum dedicated to preserving the historical memory and cultural heritage of Cameron Highlands. Opened since February 2007, it’s the brainchild of See Kok Shan, an avid collector who believes that all that’s old is gold. Time Tunnel opens daily from 9am to 6pm; tickets are priced at MYR 6 per adult and MYR 4 per child. I feel excited and amazing to see all this past things. It really brought me back to my childhood days seeing things like soft drink, ti kum, old kitchen, old aluminum hot flask, ice cream bicycle, traveling food stall and etc. To add on, some items can be moved around and take photos with. According to See, “Visitors, especially those aged 50 and above, are thrilled to see all these things from their childhood”. Therefore, I would like to bring my parents here one day. Last, heading to Tanah Rata for dinner. We’re having our dinner at Restaurant Kumar Tanah Rata. We ordered nasi goreng pattaya and Tandoori chicken set. Overall, the food was good.